Immediately intrigued by the title of this book, I read the premise only to be more intrigued. In Search of the Perfect Singing Flamingo includes a character with Williams syndrome. A few years ago, I met someone with Williams syndrome, and at the time, it was the first I’d heard of it , despite the fact that it affects 1 in 10,000 people worldwide. This book isn’t about Williams syndrome – it’s about a family and how their experience with Williams syndrome has affected their lives. It really isn’t different from any other family – we all have qualities and/or family members who both complicate and enrich our lives. Yet it’s still interesting to read about Starr and the qualities and challenges unique to her and her family. Starr’s father, Henry, has always been very protective of Starr, and tries to make her life as easy for her as possible. As sweet as this sounds, Starr’s mother, Kathleen, wishes he would allow her more independence – after all, they’re not going to be around forever. In addition to this, Starr has a sister, Melanie, who adores Starr, but feels she has spent her life being seen only in relation to Starr and not as her own person. Especially by her father. Kathleen encourages Henry to take more of an interest in Melanie, who is going through some trying times of her own. The cheapness of SunVista Developers, however, isn’t why Kathleen’s sent me here. It’s clearly a get-to-know-your-daughter bid, the type of plan my wife reads about in self-improvement books. It all feels a bit like detention and I half-expect Mr. Wellington, my grade nine civics instructor, to pop out and berate me for my life choices. ‘This is exactly what I warned you would come from bad penmanship.’ Fifty-three and my wife’s sending me on remedial field trips. The book is told from the perspectives of Henry, Starr, Melanie, and Darren. Darren is a high school student who works part-time at Frankie’s Funhouse, where Henry works. His part adds an “outsider-looking-in” perspective to the story, which is valuable, but I had a hard time being interested in him as a character. Starr and her father go on a road trip with Darren… I enjoyed the father-daughter parts – and the comedic scenes involving Starr’s crush on Michael J. Fox and her turtles, Alex and Mallory – but feel as though the story would have been fine without Darren. I preferred the Robinson family dynamics: Starr is struggling with her job, her roommate, and her independence; Henry is struggling with the relationships he has with his daughters; his wife is struggling with the unintentional extra stress being put on her by Henry’s actions and decisions; and Melanie is struggling with starting her own family. The messiness of “ordinary” life. … the truth is that I miss my dad. I like that he always tries to take care of me, make me happy, that he still calls me his girl. What mom says is important – it’s my life. Being told what to do gets tiring. But I also miss the way it used to be between me and dad. / It’s hard to wish for both. In Search of the Perfect Singing Flamingo is full of heart and humour. This short piece will give you an idea of Tacon’s writing style – a style that, along with the structure of alternating narratives, brought to mind a gentler version of We’re All In This Together by Amy Jones. 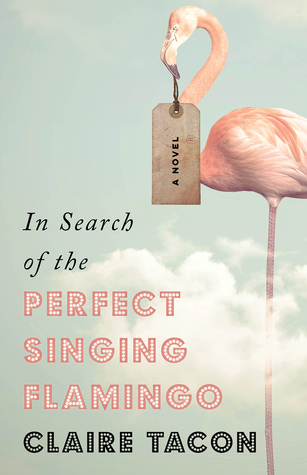 In Search of the Perfect Singing Flamingo is Claire Tacon‘s second book. Her first book, In the Field, I have just learned, was the winner of the 2010 Metcalf-Rooke award and takes place in rural Nova Scotia. A must read for me! Thank you to Wolsak & Wynn for sending me an ARC of this book! Yes, I have had In the Field on my TBR forever! It was published by Biblioasis here, and I’m definitely intrigued by it! I’m upset that our library system doesn’t have it. I’ve put it on my wishlist! Worth picking up for the title alone! I like reading about disability and families too. This sounds as if it’s written with a good deal of empathy which is a difficult trick to pull off. She wrote it in a way that allows you to see where everyone is coming from, and that there are no easy answers. What an unusual title. I like the cover design…. I do love a book written from multiple viewpoints and the subject matter is intriguing. I haven’t heard of Williams Syndrome either. Interesting. This is the kind of book I love-families just trying to be the best kind of families they can. I suppose that has to do more with the stage of life I’m in, but this sounds like something I would really enjoy. Yes! I love that, too! Do you have this one in your piles? This appeals to me because I do love a family saga, messy, complicated relationships, and multiple perspectives. Thanks for putting it on my radar. I think it will have wide appeal! How does the title play a role in the novel? I was hoping there would be lots of mentions of flamingos! There is a singing flamingo automaton that Henry wants to pick up in the US, which is how they end up on their road trip. I mean I want the anamatronic flamingo! I love flamingos! I was a bit clueless about Williams syndrome but now I know. Sounds like an enjoyable family story. It’s a good read if you like stories about families! Oh, yeah: great title! I like the combo of adjectives in the blurb by Michael Christie too: ‘hilarious’ and ‘humane’. I’ll be interested to see how you get on with the first one, which does indeed sound like the perfect match for you! Our library system doesn’t have it, so it’s on my list to buy the next time I’m ready to buy some books (financially ready, of course… in every other way I’m always ready!). I wouldn’t call it “hilarious”, but “humane” is a good descriptor for it.